At the beginning of the month it was decided to raise money for Movember, we would shave one guy’s facial hair and head but as a a bit of fair play, the girls all had to wear moustaches for the day on “M”ovember 30th. 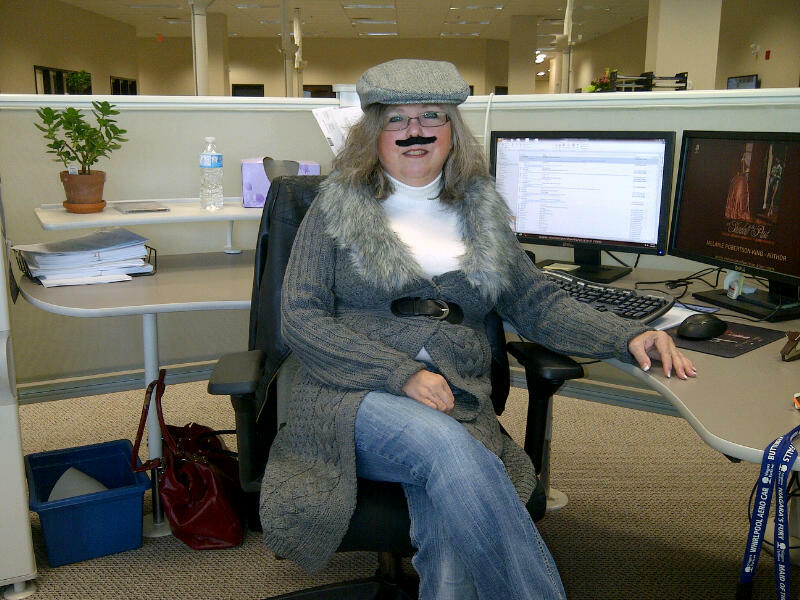 So here I am sporting my ‘stache’. Now, when breast cancer month rolls around, we think we should make the guys all wear bras for a day. What do you think? Turnabout is fair play? All’s fair in fund raising for a cure for cancer? A Special St Andrews Celebration! 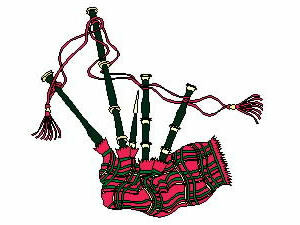 For those of you who don’t know, St Andrew is the patron saint of Scotland. He is celebrated on this day with feasts and ceilidhs and good friends coming together. Something else that you might not know about November 30th, is that it’s the opening day of haggis hunting season but we’ll save that for another St Andrews Day post. But, there something even better than that happening at Celtic Connexions today. 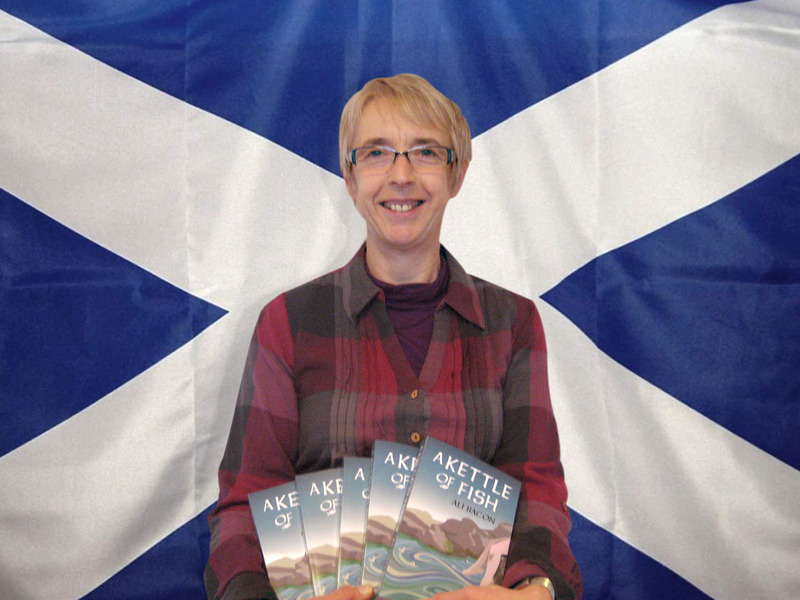 I’m thrilled to welcome, Dumfermline, Scotland native, author Ali Bacon to my blog today. 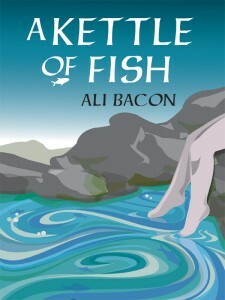 Oh, and look, she’s got a paperback copy of her novel – A Kettle of Fish with her. I think you’ll like what I have in store for you at the ceilidh tonight, Ali. I tried to get the Old Blind Dogs but they weren’t available. However, I did manage to secure their tribute band, the Senior, Sight Challenged Hounds. (swish of swinging door as the manservant returns with a tray carrying a decanter of whisky, two glasses and water). “Your whisky, my lady,” he says as he places it on the table. As the manservant straightens to leave, I cry out… “Donald, where’s your trousers?” because so unlike him, he’s wearing a kilt! Overcome by the shock of seeing him dressed in that fashion, it takes me a moment to regain my composure. (fans self with copy of Leopard Magazine). Well, while we wait for our meal to be ready, Ali, let’s chat about your novel. I’m really interested to find out more about it and your creative process. I know A Kettle of Fish is a coming of age story. Is it YA or YA Crossover or another genre? Believe it or not, I wrote the novel as adult fiction and it was only during the writing that Ailsa – my eighteen-year-old heroine – took over the central role. To be honest I think it still belongs in the adult genre and none of my readers (so far!) has quarrelled with that, but I think books about young people will often attract a young readership and so if pushed (go on, push me!) I suppose I’d say it’s adult with YA crossover – but maybe not for under 15s in view of some of the steamier scenes. What made you choose that title? Or did the publisher suggest it? Previous titles were ‘The Water’s Edge’ – too bland, I thought, and ‘The Treatment Room’ – too grisly! 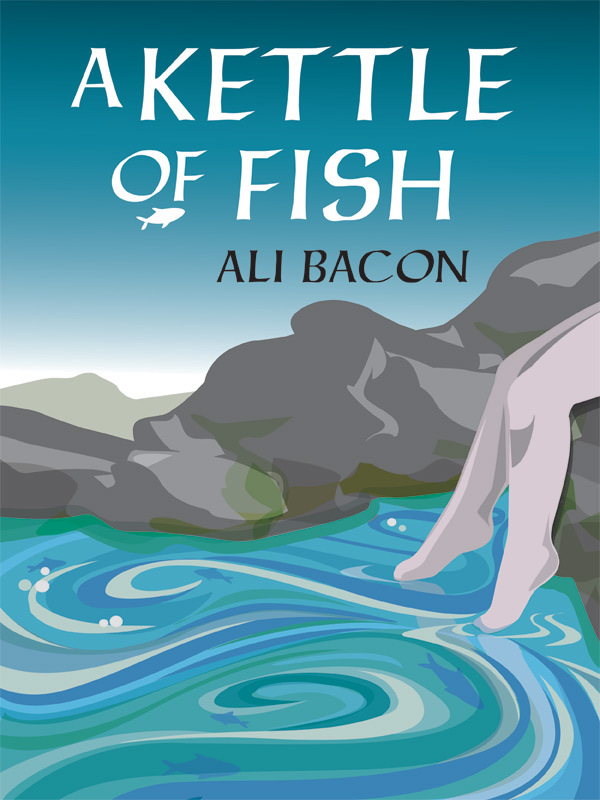 When I chose ‘A Kettle of fish’ I was looking for something a bit quirky that reflected the themes of the sea and fishing. I was very pleased when the publisher wanted to keep it. Your cover is really intriguing with the foot dipping in the water. Did you have any input into its design? Oh yes! Before being taken on by Thornberry I was about to self-publish and had already asked my daughter – a graphic designer who is now working freelance – if she would take on the design. Thornberry allowed us to carry on with this although they of course had the final say. After some discussion I hit on the rock pool as the image to go with because I wanted to convey something ‘lurking’ in the waters of Ailsa’s past. Ellie took it from there – it was fun to be involved and to see how the design process works. Luckily we all agreed on the end result! Your novel is set in Fife and Edinburgh. Did you have to do a lot of research to get the two areas right? Well the book is set in Dunfermline, where I grew up but that was (ahem) a while ago. My memories were refreshed by a trip north a few years ago, but I did pick my sister’s brains quite a lot and spent lots of time with Google maps. Edinburghwas a bit easier as the city centre is so well known, but another trip in 2011 was a real help in remembering the feel of the place. I have to ask this one… how did you come up with the names for your characters? I loved the name Tom Robertson. I had an Uncle Tommie Robertson (my dad’s oldest brother). Funny you should ask! I have to admit I put names in my first drafts pretty much by pulling them out of the air and they usually stick. I think I choose the Christian name first and that is pure instinct. The last name is added afterwards just to sound right and to go with the picture I have of the character in my head. I have just discovered there was a real Scottish artist called Tom Robertson although long before ‘my’ Tom’s time, and my sister says she remembers a teacher of this name too, but I have no conscious memory of him. Who knows, maybe I bumped into your uncle somewhere too! What’s your next project? Do you have another novel started? Oh dear, I do and I don’t! While writing Kettle I stumbled on a (real) Scottish Victorian artist with an amazing life story and connections to Dunfermline. Since then I’ve been working on a historical novel inspired by him, but there’s a lot of research involved and at the moment doing things like visiting Canada for St. Andrews night is so much more fun. Fingers crossed for progress in the New Year! The manservant returns and tells us that dinner is served… so we pick up our drinks and at the first skirl of the pipes, wait for him to enter the room and we get piped in to the formal dining room (I wish I had one of them, too) to the strains of The Bonnie Lass of Fyvie for a feast of Cullen Skink, Roast Lamb and Potatoes, served with a rose wine (red is too much and white is too light so I’m splitting the difference) and fall fruit with vanilla rice pudding for our sweet afterwards. Wow this is my kind of menu, especially the rice pud! Best not eat too much though or I won’t be up to the dancing. There is dancing, isn’t there? Oh, plenty of dancing. The band will be arriving shortly and will set up in the ballroom. The rest of the guests will be along shortly after that. And don’t forget you are invited back to http://alibacon.com for a return visit on Burns Night 2013 where we’ll be addressing the haggis as well as the world. November 29 is the date for this years DBIA Christmas Open House in downtown Brockville. Stores will be staying open until 10:00 p.m. to offer a selection of Christmas shopping opportunities for that special gift for the hard to buy for person on your list. There will be carolers to listen to, horse and wagon rides and tasty goodies to sample, too. 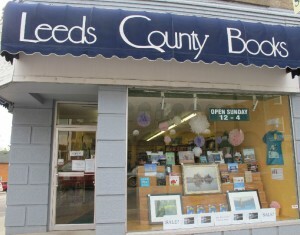 Participating business include Leeds County Books, 73 King Street West, Brockville, on Thursday evening where I’ll be signing copies of my novel, A Shadow in the Past. You’ll find books by local authors, international best-sellers, and in every genre from childrens’ picture books to dark, gritty crime novels, to non-fiction titles. I’ll be in the store from 7:00-9:00 p.m. signing copies of my debut novel – A Shadow in the Past. So come on out on Thursday night. Support the downtown merchants. Give the gift of reading this Christmas… to the avid reader on your list, or get that reluctant reader hooked. 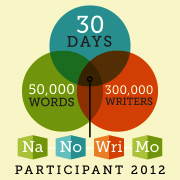 For a while there wasn’t much happening on the NaNoWriMo front. My train of thought got derailed. Other commitments kept me from writing. But the ideas began percolating in the grey matter over this past week (amazing how that happens when you’re not run off your feet with other things) and so far this weekend I’ve managed to get 1984 words written. Sounds a little Orwellian, don’t you think? Anyway, now that my feeble attempt at humour is out of my system, can I have a drum roll, please… I have cracked the 13,000 word mark. My total right now is… 13150! Yay! 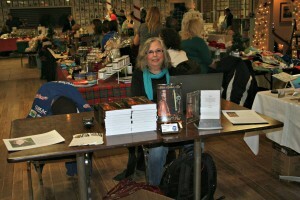 In addition to books, promotional items, my bio and reviews, I took my laptop with me on Sunday. The idea behind that was maybe I could get some NaNoWriMo writing done. That didn’t happen. It was too busy – many distractions and people to talk to. However, I do think I look “authorly” here behind my laptop at my table. What do you think? Authorly or not? I wasn’t sure what to expect today when we unloaded the car this morning at the Mallorytown Legion. 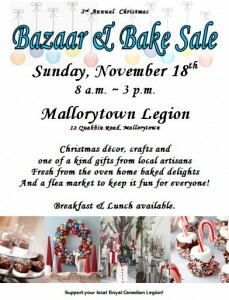 Small village, area artisans and loads of baked goods and other things for competition, plus I had to pay for my table at this event. Mind you, selling one book would more than cover the cost of the table. How hard would it be to sell one book? My table was on the dance floor directly in front of the stage. It was decided before I arrived that would be the best placement since they were doing face painting on the stage which would attract a younger crowd… and with the younger crowd… parents. For this event, I made up two additional bits to take with me. I created a two-column, landscape orientation bio – column 1 my photo, column 2 the text. It attracted quite a bit of attention and by times more than my display of books. The other additional page was a copy of my book cover in the upper left, a catchy title and the back cover blurb, and excerpts from three reviews I’ve received (all with the reviewers’ consent – I asked first before I used them). I mean, why not have that at hand? You can see both of these in the first picture – one on either side of my display. However, even though they’ve become part of my repertoire, before they see the light of day again, I’m going to pick up a couple of acrylic photo frames and put them into those so that they stand up rather than lay “flat” on the table. They were still curled from coming “hot off the presses” this morning. So, how did my day go as far as sales? 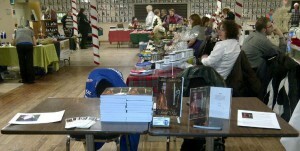 I’m pleased to day I added another 5 books to my total from Ladies Night on Friday. 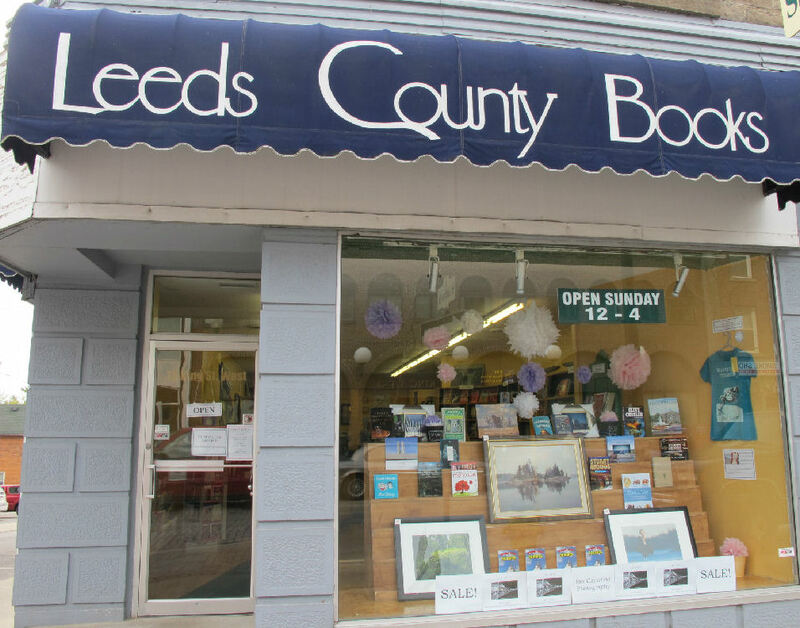 My next event is the Christmas Open House where I’ll be at my local independent bookstore, Leeds County Books, on November 29th from 7:00-9:00 p.m. 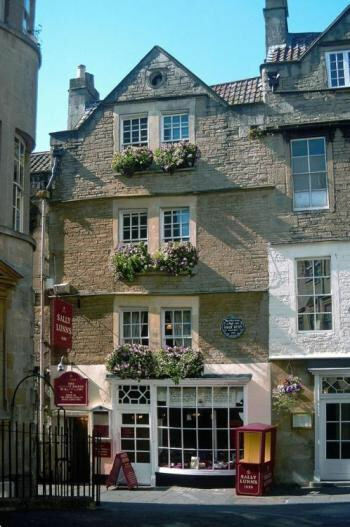 While I’m physically at the Mallorytown Legion taking part in their Christmas Bazaar and Bake Sale, virtually, I’ll be in Bath, England talking with my author friend, Jo Lambert, at Sally Lunn’s Tea House and Restaurant. Isn’t this a fabulous old building? 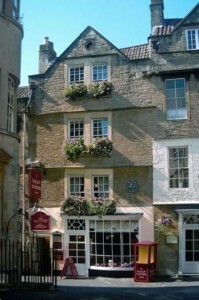 While I’m here, I plan on having one of their scrumptious Bath Buns – I just need to decide if I want sweet or savory. Their menu options are so varied, it’s really hard to decide. To eavesdrop on our chat, drop by Jo’s blog. Looking for that special Christmas Gift for that hard-to-buy for person on your list? 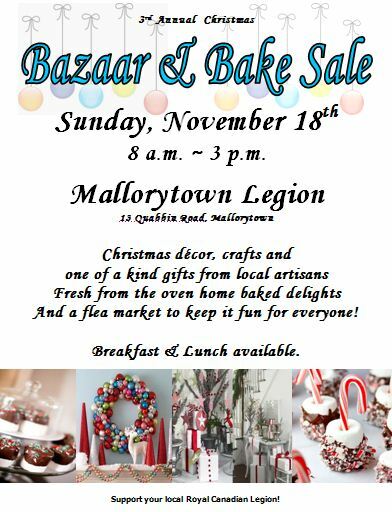 Don’t forget the 3rd Annual Christmas Bazaar & Bake Sale on Sunday, November 18th at the Mallorytown Legion. If you’re looking for that special Christmas gift, there will be plenty of items to choose from. I’ll be there signing and selling my debut novel, A Shadow in the Past, a book suitable for the YA reader in your family. So why not Give the Gift of Reading this holiday season? The Legion is located on Quabbin Road (County Road 4) in the village of Mallorytown, Ontario. I hope to see you there on Sunday. I’m pleased with the results of tonight’s foray into the unknown realm of Ladies Night. Invited by the owner of Green Things Garden, Gift and Maintenance Services – Donna White – to come and sign my book, I arrived about 5:30 p.m. to get myself set up. Business in the retail store, all decked out in its Christmas finery, was brisk and my book and I attracted a lot of attention. But best of all, by 8:45 p.m., I had sold… drum roll, please… six copies! 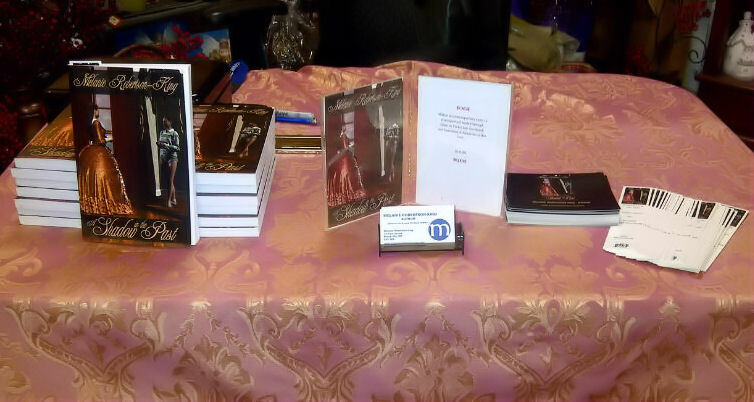 If you missed me tonight, I’ll be at the Mallorytown Legion on Sunday, November 18th, from 8:00 a.m. to 3:00 p.m. signing copies of my novel, A Shadow in the Past. Will I do Ladies Night again next year? YES! And maybe by this time next year, I’ll have two books out there to sell. Guess that means I best get my skates on and get book #2 submission ready. Tomorrow night, Friday, November 16th, I’ll be taking part in the 21st Annual Ladies Night. 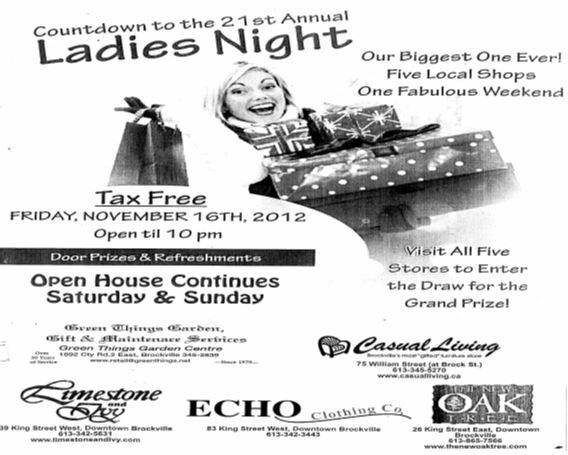 Brockville and area businesses open Friday night until 10:00 p.m. with tax free savings. I’ll be signing and selling my novel, A Shadow in the Past, at Green Things Garden, Gift & Maintenance Services from 6:00-10:00. I hope to see you there. And be sure to visit all five stores to enter the draw for the Grand Prize! There will be door prizes and refreshments at the various locations throughout the evening.